France, Royal. Charles V, AD 1364 to 1380. Silver Blanc au K.
Denomination : Silver Blanc au "K". Date : Issue of April 20, 1365. Size : 25.4 x 26.5 mm. Weight : 2.08 grams. Grade : gVF and fairly well struck for the issue. 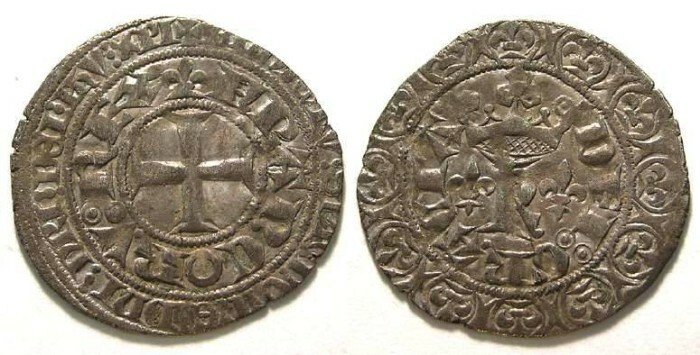 Obverse : Short cross within two circles of inscriptions. Reverse : Crowned "K" flanked by two lis, with DIE GRATIA around, all within a circle of lis in circles.